Paper dolls! I haven't played with ink and paper in quite some time. It is so much fun to get lost in the process. 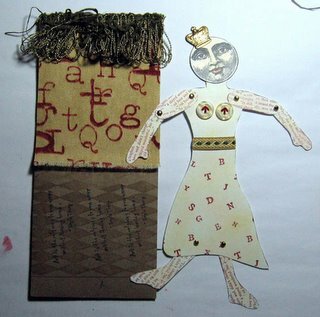 this little lady was created for an altered book exchange, we were given the envelope, that will be the book part and she fits inside, just barely. I started out by just pulling things I like to work with and then decided the fabric with the red letters was to be the inspiration and she took off from there. February 8, 2006 by carol strand.